There are several ways to title the theory but the principle itself is simple. 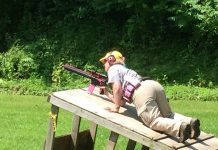 A rifle is a significantly better tool in a fight than a handgun, with rare circumstantial exception. Carrying a rifle discretely is also significantly more challenging than a discreet little Glock 43 or Sig P365. TUFF Products and Sentinel Concepts developed the Revelation 2.0 to significantly advance the EDC Carbine concept by increasing it’s ease. The design incorporates aspects to better conceal the firearm, better carry the carbine and supporting equipment, and more easily deploy the firearm if necessary. Steve Fisher’s brainchild given form. From the exterior the bag is much more akin to a hiking day pack than a MOLLE ensconced ‘Assault Pack’ or 3-Day Bag. This deliberate camouflage stops the user from screaming to the world ‘I might be carrying a gun!’ in the same manner a Cabela’s fishing vest telegraphs the same. The shoulder straps are adjustable for ride height comfort and fit while being well padded. It wears very comfortably across the back and shoulders. A top carry handle is attached, well sewn, and easily supports the weight of the carried equipment. The soft rounded design carries even a fully loaded bag comfortably. 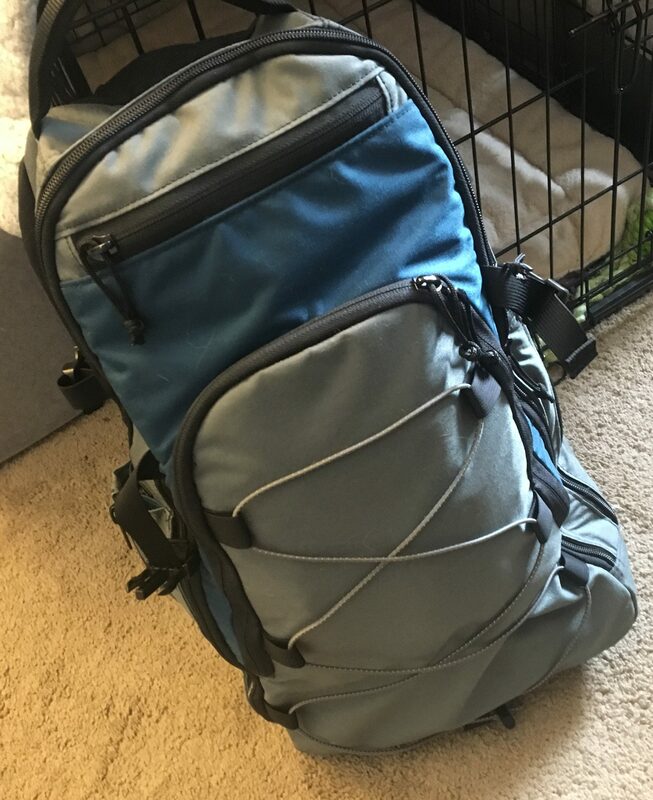 The water pockets on either side, exterior helmet bungee, and avoiding tactical stereotypical colors like flat dark earth, coyote, and olive drab green keep the backpack looking exactly like a backpack. 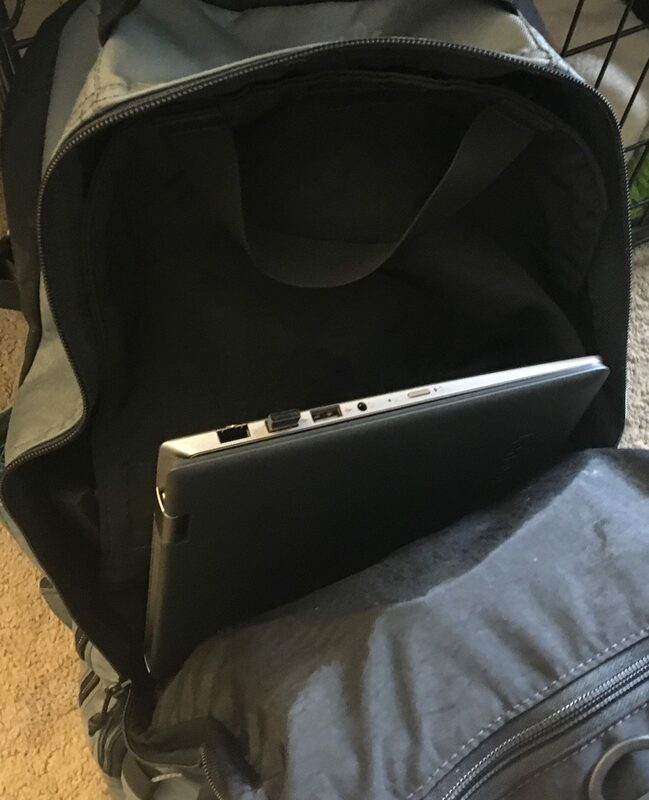 Convenient since the Revelation 2.0 is, by appearance and function, a backpack. It stores my laptop, power cords, and binders if needed with ease. Pockets for everything exist as you customize layering what you carry to fit what you need where you need it for when you need it. Within the main pocket, the firearm side is designed to hold a variety of carbine style pistols and SBRs. Specifically spaced to fit a 10.5″ barreled AR with a law tactical folder for the buffer and stock/brace. Essentially a ‘MK18‘ clone with a folding stock. A 20 round, 30 round, or Magpul D-60 magazine will fit in the carbines while stored. Similar magazine sizes will store and the carbines can support small optics like RMR’s, ACOG’s, Aimpoint’s, and similar options. The pocket opens with a pull handle allowing access to the carbine. The zippers on the outer pocket will unzip with pressure from your arm and it and the divider clear the path for a draw, when done deliberately. The bottom of the Revelation 2.0 is rigid and reinforced to protect the firearm’s muzzle while the bag is being picked up and put down constantly. 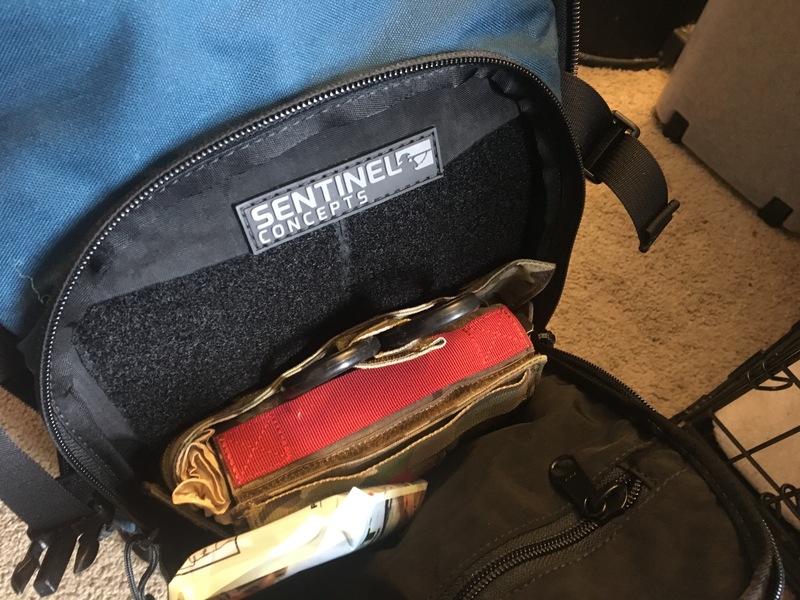 This protects from printing through the bottom of the bag and keeps the profile well squared up while protecting the carbine. In the pocket on the front I keep a Blue Force Gear/Vicker’s UDC sling, compatible with both the Galil ACE I have in testing and my Zenith MP5. In the bottom of the main pocket two 40 round Magpul PMAGs sit horizontally perfectly for additional ammunition. This, along with a magazine in the carbine, gives the user between 100-140 rounds. With the MP5 two 30 round magazines in the same spot give the user an easy 90 rounds total, more or less at will and as desired. I’ve come to use a 3 magazine standard for these carry set ups. With an AR compatible option a D-60 allows that on board capacity to sit closer to or just above 4 standard mags. This isn’t an ‘outside the wire’ patrol set up so much as a get out of danger trump card. The tactic set in motion is to pull and deploy the carbine to engage and eliminate or suppress the immediate threat and then pull the two spare magazines and place them in your pockets for reloads. If time and safety allow, you can pull and attach the sling before re-zipping the Revelation 2.0 to carry your remaining equipment. Then extract you and yours from the threatened or dangerous area. So that covers the kit in theory and the Revelation 2.0‘s place within the scope of that theory. 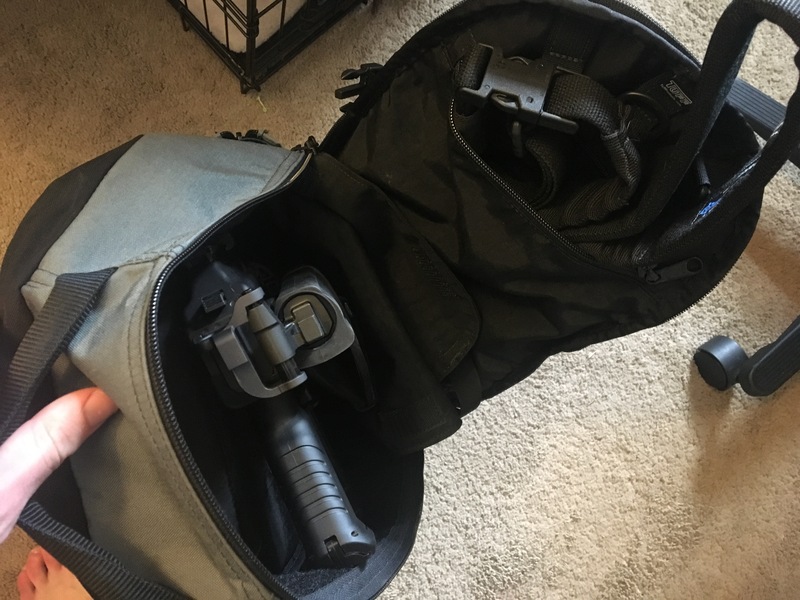 The end user can pack a quickly accessible carbine, carry it as easily and conveniently as any backpack, and carry your every day items and other emergency equipment all in a nondescript manner. 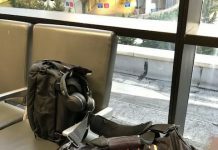 Whether the Revelation 2.0 is riding shotgun (carbine) in the seat beside you, stored accessibly within arms reach, or on your back while wandering about your day it discreetly accompanies you with more gear than your belt and pockets can support. To truly test the concept though it has to be used. It would not do to have all of the equipment to assist you theoretically and it in practicality be largely inaccessible. To gather data on the bag I set up a drill. One round on target from 25 yards, timed. Starting from a neutral standing position, facing the target, and wearing the Revelation 2.0 on both shoulders. On the buzzer remove the bag from your shoulders, draw the carbine, ready the carbine, and fire a round into the target. The carbine is carried Condition 3 (full magazine, empty chamber) and so the charging handle has to be cycled to ready the weapon. But the time savings is academic between a Condition 3 and Condition 1 weapon used in this method. This is not your carry sidearm, it is not your on demand weapon. The carbine is your overmatch weapon, your ‘up gun’. It can be readied quickly but if you need your gun immediately for a close direct threat with no time buffer your sidearm is your gun to grab. The carbine gets engaged when you have a time buffer, you don’t need long… but you do need time. Illustratively, a 2.00 second draw from concealment is slow with one of my Sigs. 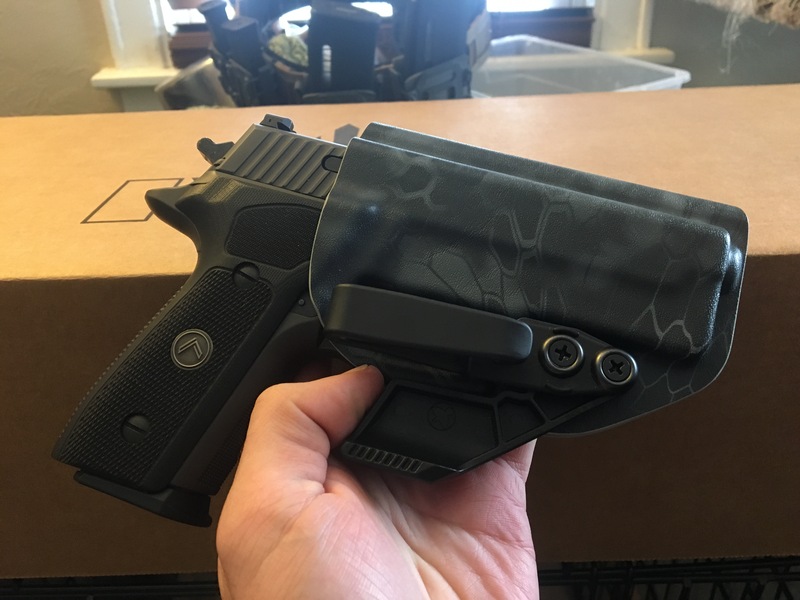 P229 Legion in a HolsterCo Stealth. I’m not that fast and there are many who can push sub second draw times, especially from appendix carry. Drawing the Galil ACE from the Revelation 2.0 has many more steps and my fastest time was 8.52 seconds. Slowest was 11.59 and we’ll use that to extrapolate that under duress with a performance decrease I will be 5-7 times slower getting the carbine than getting the pistol. After repeated iterations I averaged a time of 9.51 seconds to target engagement. Not bad. Excellent actually and a significant improvement from the more traditional style assault pack I was using for my MP5. The Revelation 2.0, being purpose built for this application, executes it’s duties superbly. Staging the pack is key as is knowing your body mechanics. 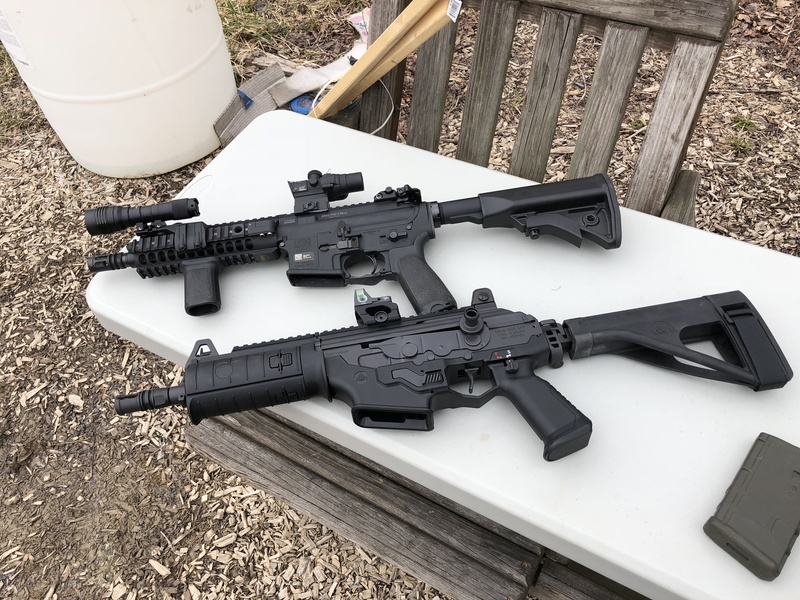 As a right handed shooter I set the Galil (and MP5) up with the folded pistol brace outward facing (away from your back while worn), pistol grip pointing to the left, muzzle down. 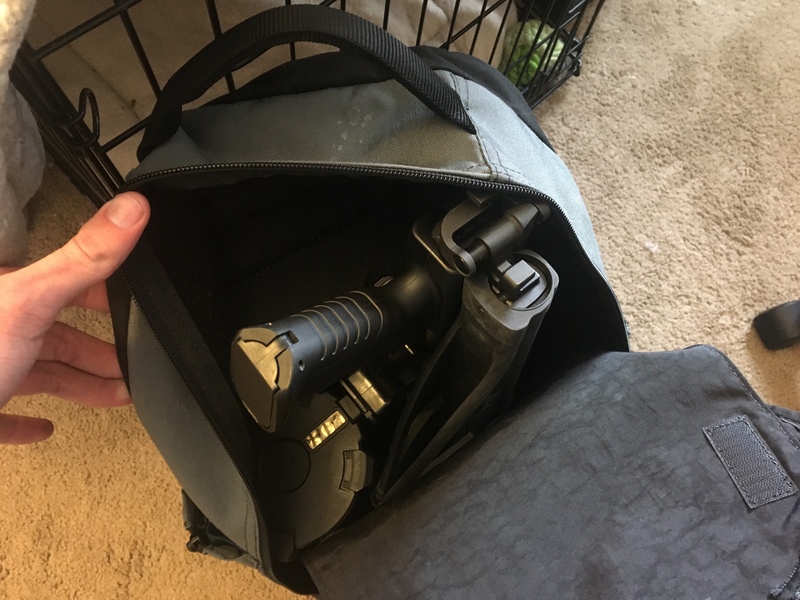 This allows the bag to be slid off the shoulder and be grounded in a manner that places the pistol grip toward the user when the bag is opened. 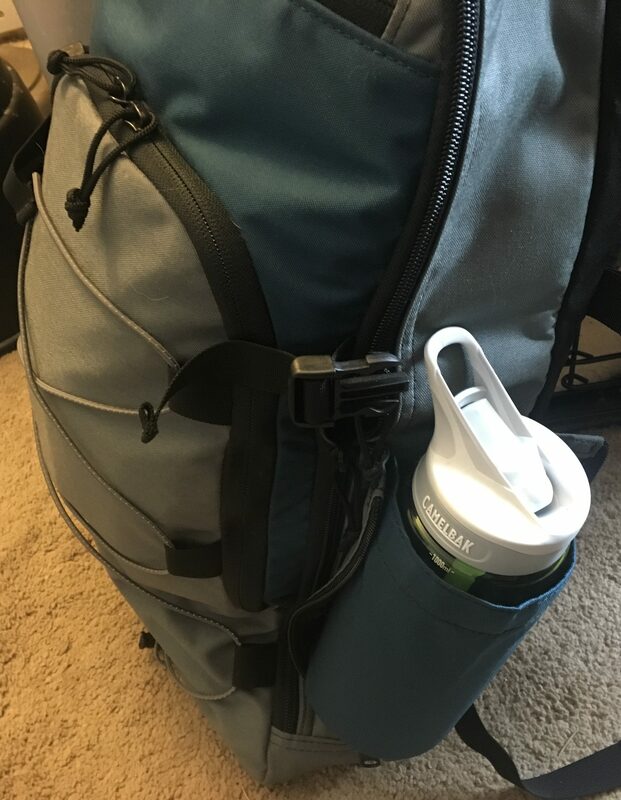 The zippers for the main pocket get staged by the buckle on the upper right so that grabbing the top zipper and pulling toward you opens the compartment. Having the buckles closed on either side will not prevent drawing the gun (but may slow the process) and the buckle can be useful for keeping the zippers spaced. Another method would be to pick the ‘Primary’ zipper, the one you pull to get to the gun, and remove or shorten the cord on the other. Pick a method that operates smoothly for you. After accessing the main compartment, pulling the handle on top of the divider reveals the carbine. Brace. Safety Off. Engage Target. All in an average of 9.51 seconds. The Galil ACE’s side charger and folder designs aided these actions. 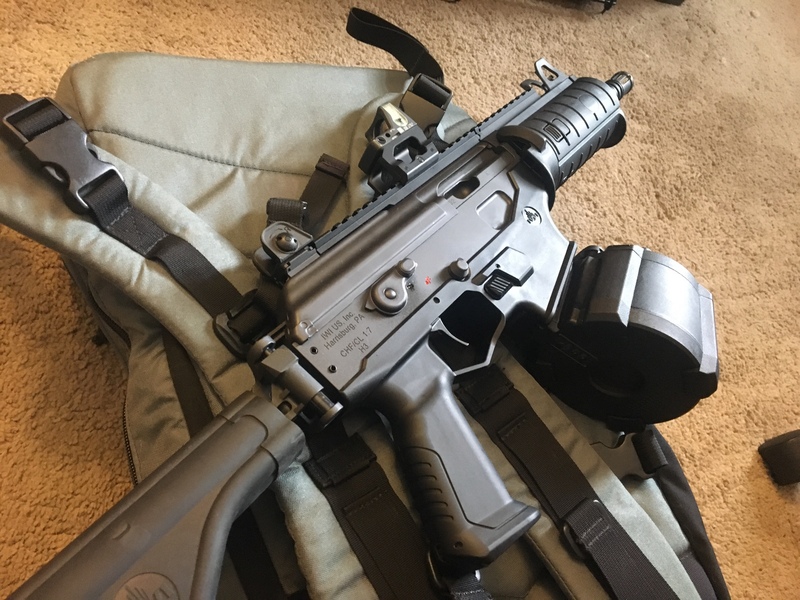 If necessary the ACE and Zenith MP5 can fire brace folded too, the safety on the Galil ACE is tougher to operate this way since it’ll rub on the folded brace. As time and safety allow grab and pocket your spare magazines and then re-zip and shoulder the Revelation 2.0. Getting to the IFAK involves nearly the same set of motions. Up gunning made simple. 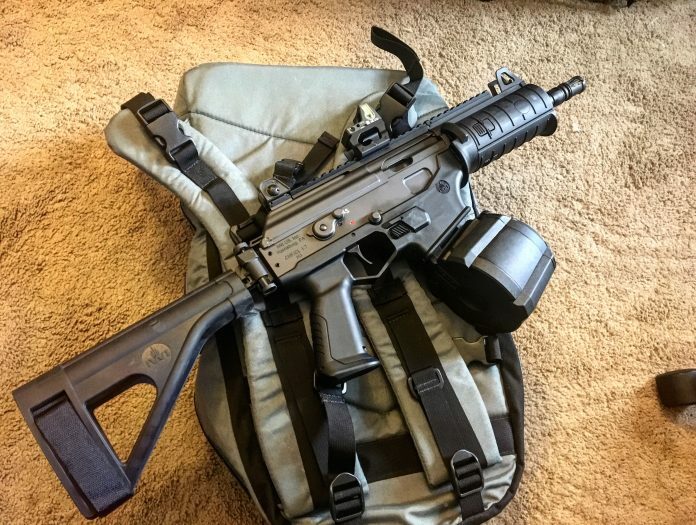 EDC Carbine in both theory and practice. That’s the beauty of the Revelation 2.0. If you’re interested in a course with Sentinel Concepts, here. I would recommend them. For a review on the Galil stay tuned.